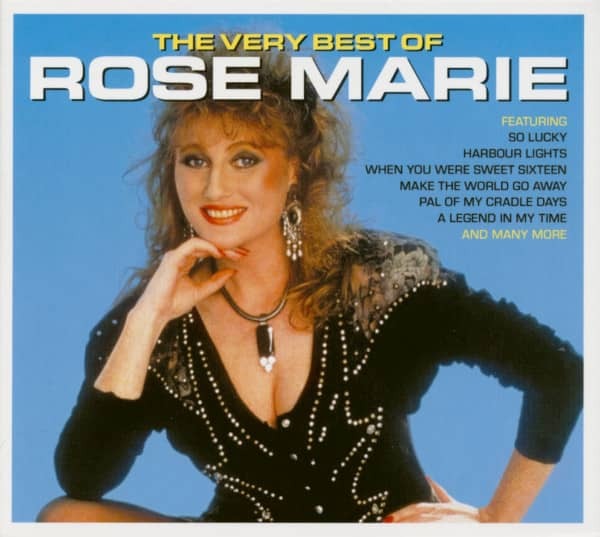 Born in a small village near Newry, Northern Ireland, in the Fifties, Rose Marie wanted to be an entertainer for as long as she could remember. She could recall serenading the cows on the family's farm with a version of 'Danny Boy', her first inspiration not a female diva but Welsh singing legend Tom Jones. Her parents wanted her to have what they regarded as a 'proper' job — but the hairdressing world's loss was showbiz's gain. Rose abandoned crimping and started singing, and never looked back. Five feet three with blue eyes, flame hair and slender legs that seemed to go on forever, it was a case of 'once seen (and heard), never forgotten'! She was discovered by the 15 million viewers who tuned in to TV's Search For A Star in 1980, and the instant response she evoked quickly elevated her from the UK working men's club circuit, where she'd been paying her dues and honing her entertainment skills, to appearances on the popular Saturday night prime-time game show Punchlines, hosted by Lennie Bennett. Television loved Rose Marie, and she used the medium to show the world that singing was only one of her talents. 'People realised I could sing, I could entertain and I could make people laugh.' Her sense of fun made her a popular variety-show guest, and soon the likes of Blankety Blank were knocking on her dressing-room door. Panto, summer seasons and radio shows all followed, while Shooting Stars, Doctors and Big Brother's Little Brother all feature on her resume. She's also starred onstage as Mrs John-stone in Blood Brothers. Rose Marie's first gold record came with 'Rose Marie Sings Just For You', her debut Top 30 album back in 1985 which included a hit single in Irving Berlin's 'When I Leave The World Behind'. This dated from 1915, and was accompanied by further updated oldies in 'Sunshine Of Your Smile' (a US chart-topper in 1916), 'Cry' (1949), 'You'll Never Know' (1943), 'My Mother's Eyes' (1929), let The Rest Of The World Go By' (1920) 'I Apolo-gise' (1931) and 'Pal Of My Cradle Days' (1925). Further classy covers originated in the worlds of country music Make The World Go Away', 'Legend In My Time'), gospel ('The Old Rugged Cross') and even Sixties pop (Timi Yuro's 'Hurt'). Another long-player, 'So Lucky', followed, but it was next album 'Teardrops And Romance', that created a storm, with Rose depicted in glamorous pose on its cover. The record sold over half a million copies in its first few days on sale, but its sleeve got her in the headlines when a London borough declared the advertising posters 'too provocative'. Undeterred, our girl promptly insured her legs with Lloyds of London for a cool million pounds and signed a contract to promote a leading brand of stockings! The 1987 album contained the now popular mix of well known songs with obscurities spanning several decades, and our collection shows these off to good effect. Customer evaluation for "The Very Best Of Rose Marie (2-CD)"